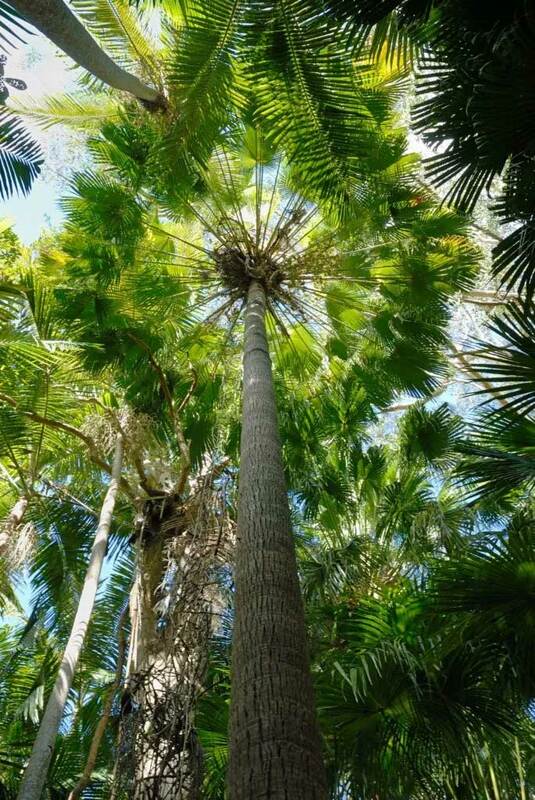 An Australian rainforest native that is the southernmost growing fan palm. It grows naturally along the eastern coast from Qld to Victoria. Known as daranggara to Eora people. A very popular hardy landscaping plant. It is a solitary, tall palm with a slender grey trunk and a crown of large deep green shiny fanshaped fronds about 4m long. Massed cream flowers are followed by black fruits. Beautiful when young with upright fan fronds coming out from the ground, lovely when mature with the points of the fans drooping in a weeping habit. The Cabbage Tree Palm occurs in open forest, often in swampy sites and on margins of rainforests. The young and tender unfolded leaves are eaten like cabbages. The young leaf buds at the top of the plant are also edible but, since the plants are unable to produce side-shoots, this kills the plant. The Aboriginal people of the Sydney area use the leaves as roof thatch and for weaving baskets. They also used the fibrous bark to make fishing lines. In Cape York, shallow bag-like nets are made from the bark fibres. Very hardy in full sun or part shade and various soils (neutral to acid is best). Wind resistant, salt tolerant, and frost tolerant. Tolerant of drought when established. Can be grown successfully in containers for many years. For container plants, water moderately, less in winter. Attractive indoor plant. Palms have deep penetrating root systems and establish best when planted out at a young stage. However, older plants are more cold tolerant than juvenile plants. In areas at the limit of their cold tolerance it is best to grow the plants in containers for some years, giving them winter protection. Cabbage Palms can be transplanted even when very large. Although the thick fleshy roots are easily damaged and/or desiccated, new roots are generally freely produced. It is important to stake the plant very firmly to prevent rock, and also to give it plenty of water until re-established - removing many of the leaves can also help. Indoor plants may get mealy bugs - take outdoors for a week. You can also remove them by hand. It is best not to spray palms with white oil.